Read on, but here’s the short version: this is about the dumbest thing I’ve seen an EMU President (James Smith) and an EMU administration do since John Fallon et al tried to cover-up/hush-up the investigation of Laura Dickinson’s murder in 2006. 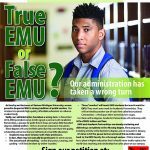 I’m not suggesting this is as bad— not getting the word out to the university community about a murder is obviously lots worse, and Fallon and EMU paid a heavy price for all that. But I am saying this is in the same league of stupid and about as tone-deaf. “Let’s kick out of school some African American students for protesting against racist graffiti after hours in the student center, because hey, rules are rules.” WTF?! ?